S. Narayanaswamy discusses the book, The Gandhian Philosophy Of Spinning-Wheel, by Mohit Chakrabarti, Concept Publishing Company, New Delhi, 2000. In 1921, Gandhi described Hind Swaraj (written in 1909) as a "whole theory of life" (Young India, January 1921), and in 1938 stated: "I have seen nothing to make me alter the views expressed in it." (Aryan Path, 1938). The book challenged almost all the political and economic principles held sacrosanct at that time. Hind Swaraj highlights all of Gandhi's basic principles, including the relationship between ends and means, between rights and duties and between religious communities, as well as his concepts of history, nationality, dissent, education and technology. These issues retain an elemental importance today, and thus give Hind Swaraj a timeless quality. Gandhi's final question in Hind Swaraj is: "How can India be free?" Hind swaraj, WRITTEN by Mohandas Karamchand Gandhi in 1909, is in the nature of a Dialogue between 'Editor' and 'Reader', a form most suitable for explaining one's philosophy of life1. It is also Gandhi's personal manifesto which challenged British claims to a superior civilisation and the rationale of Pax Britannica. Gandhi's stated objective in writing the 'booklet' was to respond to "the Indian school of violence and its prototype in South Africa", but Gandhi does much more than this. He presents his "whole theory of life"2 in it. When Gandhi wrote the book he was already a public figure and had been leading a non-violent movement against the South African Government's policy of racial discrimination and denial of rights and human dignity to the non-White communities. At the end of the book, in Appendix I (Some Authorities), Gandhi gives a list of books, "recommended for perusal to follow up the study of the foregoing", of writers who had deeply influenced his economic and political thinking. Ruskin and Tolstoy so influenced Gandhi that in 1904, several years before he wrote Hind Swaraj, he fundamentally changed his way of life and established what was to be his first Ashram, called Phoenix, near Durban, capital of Natal Province in South Africa. This was in affirmation of the three principles which moved him, namely the infinite possibilities of universal love, the social equality of all labour and the dignity and supreme value of manual labour3. Among the objectives of the settlers on Phoenix farm were the following: to order one's life so as to earn a living through handicrafts and agriculture without the aid of machinery, to promote better understanding between peoples, to live a pure life and thereby set an example for others, to try and promote the ideals of Ruskin and Tolstoy, to introduce vernacular education, to propagate the philosophy of 'nature treatment' in the medical field, to train for social service and finally to conduct a journal for the advancement of those ideas4. In Hind Swaraj, Gandhi's views on "Modern Civilisation" may at first reading appear naive and simplistic but a little reflection will make explicit the fundamental issues he is trying to raise. People living in that civilisation, he wrote, made "bodily welfare" the object of life.5 Moreover, amassing of wealth as quickly as possible with a minimum of labour was considered 'a sign of civilisation'. Inflicting maximum destruction on large sections of humanity with a minimum of investment was another benchmark of this civilisation. In it workers chose to give up an outdoor life and slaved away in factories in 'dangerous occupations' for the sake of millionaires hoping to imitate their way of life some day. Communication and travel previously undertaken as a labour of love i.e. for special 'valuable' purposes was now a matter of lightning speed and often for the wrong reasons. To quote him "Good travels at a snail's paceĀ but evil has wings. "6 Pampering bodies with luxuries and drugs had replaced the earlier objective of maintaining health and vigour through a simple outdoor life. "This civilisation", he writes "takes note neither of morality nor of religion" and its votaries some of whom were 'brilliant' writers and 'good men' would give facts and arguments in support of it, believing them to be true. Gandhi's prediction that this "civilisation is such that one has only to be patient and it will be self-destroyed"7 seems peculiarly ominous for our contemporary world where the issue of sustainable development is the biggest challenge. 'True Civilization' as opposed to 'Modern Civilization' was, Gandhi wrote, "that mode of conduct which points out to man the path of duty. "15 Observance of morality was essential for this purpose and this required mastery over "our mind and passions". In Gandhi's philosophy the lynchpin of civilization was the "moral man" i.e. the person who could restrain himself or herself, it had nothing to do with the material superstructure generally identified with civilization. Happiness, he said was largely a mental condition, it had little to do with being rich or poor.16 The mind, he believed, was like a "restless bird" the more it gets the more it wants hence a limit had to be set to 'our indulgences'. Gandhi concluded his comparison of the Indian and Western Civilization by saying that the tendency of the former was to elevate the moral being, while that of the latter was to propagate immorality. This rather harsh condemnation was tempered by his belief that modern "civilization is not an incurable disease"17 and remedial steps taken in time could forestall the impending disaster. A major 'problematic' for Gandhi in Hind Swaraj was 'the condition of India'. India was, on the one hand, coming under the influence of 'modem civilization' because of British rule and, on the other, had become the victim of the British policy of 'divide and rule'. He discussed many contentious issues between the Hindus and Muslims of his time. Some of these are, indeed, of continuing relevance in our own times. His views in this regard also defined his concepts of 'true religion' and 'passive resistance'. Philosophically he said, "In reality there are as many religions as there are individuals, but those who are conscious of the spirit of nationality do not interfere with one another's religion".24 Explaining further he went on to say that the hallmark of a 'nation' was not a distinctive religion but the sentiment that all persons living in it, who had made it their home, were fellow countrymen, regardless of religious affiliation. In no part of the world, he asserted, were one nationality and one religion synonymous terms, nor had it ever been so in India. Another significant issue raised by Gandhi in respect of 'modern civilization' was that of cultural hegemony, which is also of particular importance in contemporary times. The British state, with all its imperial splendour, its famous Parliamentary system and magnificent industrial development was unfortunately the role model for many Indian nationalists, only the actors or players had to be different. Gandhi's apparent dislike for 'machinery' was partly because of what Manchester's' textile mills had done to India and partly because of him being 'rural-minded'. In his later writings, he said that the result of industrializing India would be like establishing an age of Ravana instead of the age of Ram. Gandhi threw a direct challenge to the British ruling establishment in as much as he says that the Indians and the English could work together only if their interests were identical. "If you act contrary to our will", he writes, "we shall not help you, and without our help, we know that you cannot move one step forward".33 Each person, he believed, had to experience this conviction for himself and not wait for others to act, the time for action would come the moment each realised, "If I do my duty, that is serve myself, I shall be able to serve others. 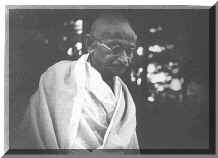 "34 Gandhi was aware that the path he advocated would involve a lot of sacrifice and suffering but then no nation had risen without suffering and "even in physical warfare the true test is suffering and not killing of others, much more so in the warfare of passive resistance. "35 He ended the chapter with an exhortation," I have endeavoured to explain it (Swaraj) as I understand it and my conscience testifies that my life henceforth is dedicated to its attainment." It may be mentioned that though Gandhi held on to the views expressed in Hind Swaraj even in 1938 in actual fact he did compromise on some key issues like 'machinery', 'railways', 'hospitals', etc. In January 1921, he wrote in Young India that the Swaraj he had visualized in Hind Swaraj was not his aim at this time because "India was not ripe for it ... it required a higher simplicity and renunciation than the people are today prepared for. "36 But his prediction may prove prophetic in the contemporary global context when 'climate change' and 'sustainable development' are posing the biggest challenges for the future of humankind. An alternative development paradigm may be the need of the hour! The history of the writing of Hind Swaraj or Indian Home Rule, originally penned in Gujarati and later translated by Gandhi himself into English, is too well known to be recounted here. All references in this paper to Hind Swaraj (abbreviated in the notes as HS) are drawn from twenty-first Reprint (November 2009) of the Revised New Edition published by Navajivan Publishing House, Ahmedabad, in 1939, which included, as Preface, the commentary written by Mahadev Desai in the Harijan to mark the Hind Swaraj Special Number of the Aryan Path (September 1938). 'A Word of Explanation' (which was originally published in Young India, January 1921 and serves as a kind of Foreword to the new edition), HS, pp. 15, 16. Collected Works of Mahatma Gandhi (CWMG), (New Delhi: The Publications Division, Ministry of Information and Broadcasting, Government of India, and Ahmedabad: The Navajivan Trust, 1965), Vol. XXXIV, p.239. CWMG, Vol. XI, pp. 321-322. Courtesy: This article has been adapted from Gandhi Marg, April-June 2011, Volume 33, No. 1.